In 1981, President Ronald Reagan claimed that trees produce more air pollution than automobiles, fueling a spate of jokes about “killer trees.” He was mostly wrong, but not completely. 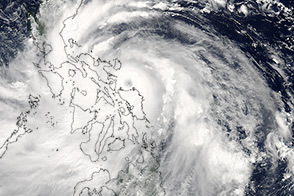 “What Reagan neglected to indicate is that unhealthly levels of ozone wouldn’t form without nitrogen oxides (NOx), pollutants emitted when gasoline and coal are burned,” explained Bryan Duncan, an atmospheric scientist at NASA’s Goddard Space Flight Center and the deputy project scientist for the Aura satellite. Since sunlight is ubiquitous and forests emit large quantities of volatile organics in the summer, it is the amount of nitrogen oxide that determines whether ozone forms over cities on hot summer days. That NOx is most often supplied by vehicles. In the 1970s and 80s, the United States spent billions trying to limit hydrocarbon emissions, but such efforts had little impact on ground-level ozone because forests were providing plenty of natural hydrocarbons. Research conducted by William Chameides of Georgia Tech underscored the futility of trying to limit hydrocarbons while ignoring nitrogen oxides. While satellites cannot measure isoprene emissions from forests directly, they can measure formaldehyde (HCHO), a gas that forms as a result of oxidizing isoprene emissions and as a byproduct of fires. 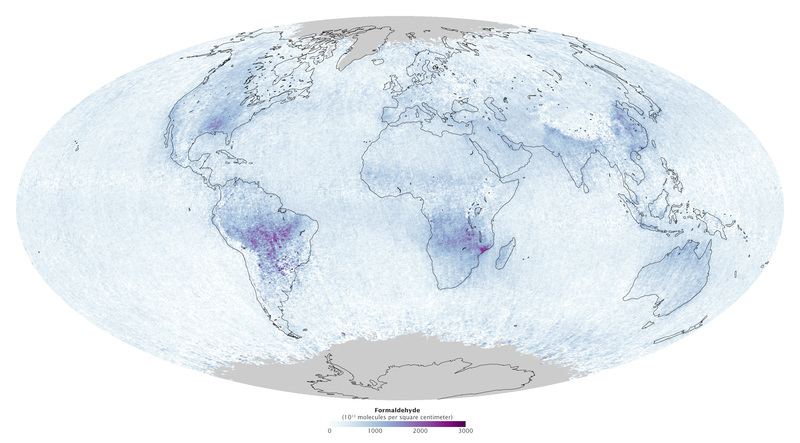 The map above, based on data collected by the Ozone Monitoring Instrument (OMI) on the Aura satellite, shows the global distribution of formaldehyde in September 2013. The highest concentrations of formaldehyde were present over the Amazon rainforest, in southeastern Africa, and in the southeastern United States. While isoprene from forests was the primary source of the formaldehyde in these areas, observations from the Moderate Resolution Imaging Spectroradiometer (MODIS) show that fires, most likely crop burning, contributed to the high levels in these areas as well. Editor’s Note: Ten years ago, the Aura satellite launched from Vandenberg Air Force Base in California. Since then, Aura has made major contributions to our understanding of Earth’s atmosphere. To read more about Aura’s accomplishments and discoveries, view this slideshow. 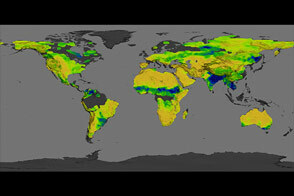 NASA map by Robert Simmon, using data from the Ozone Monitoring Instrument (OMI) on Aura. Caption by Adam Voiland, with information from Bryan Duncan (NASA Goddard Space Flight Center). While some forests emit volatile organic compounds that are involved in ozone pollution, history shows attempts to control smog have a better chance of succeeding by focusing on vehicle emissions. Associated Press News Archive (1988, September 16) Study Says Trees’ Contribution To Ozone Has Been Ignored. Accessed July 15, 2014. Chameides, W. et al. (1988, September 16) The role of biogenic hydrocarbons in urban photochemical smog: Atlanta as a case study. Science, 241 (4872), 1473-1475. Duncan, B. & Chameides, W. (2012, September 21) Effects of urban emission control strategies on the export of ozone and ozone precursors from the urban atmosphere to the troposphere. Journal of Geophysical Research, 103 (D21), 28159-28179. Duncan, B. et al. (2009, March 11) Temperature dependence of factors controlling isoprene emissions. Geophysical Research Letters, 35 (5). EOSDIS (2011, November 20) Volatile Trees. Accessed July 15, 2014. NASA (2014, June 26) New NASA Images Highlight U.S. Air Quality Improvement. Accessed July 15, 2014. University of Michigan 2014, May 9) Killer Trees? Accessed July 15, 2014. Relative Amounts of Bad Ozone Ingredients Across the U.S.